The perfect gift for your favorite beer lover! Gift Cards are available for purchase in any denomination for use specifically in our Taproom ($5 minimum). Unfortunately Gift Cards are not a valid payment online at this time. 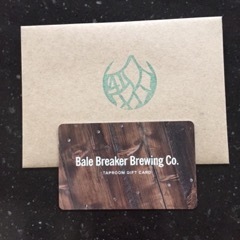 If you would like to include a personalized message with your Gift Card purchase, please email us at info@balebreaker.com.